August 2018 saw us show the DVD on Tollerton Hall that we had put together over the previous 18 months, mainly due to the hard work of Yvonne and Chris Burbank who put an enormous amount of time into producing the finished article. The evening was a huge success and we were packed to the rafters! The new owners of the Hall attended and many people met them for the first time. A super evening was had by all. The first ‘event’ we organised was on 10th May 2014 and was a walk around the village taking in special points of interest. A booklet was printed to accompany the walkers and permission was kindly granted by the farmers and land owners to enable the walkers to cross their land to access certain points. 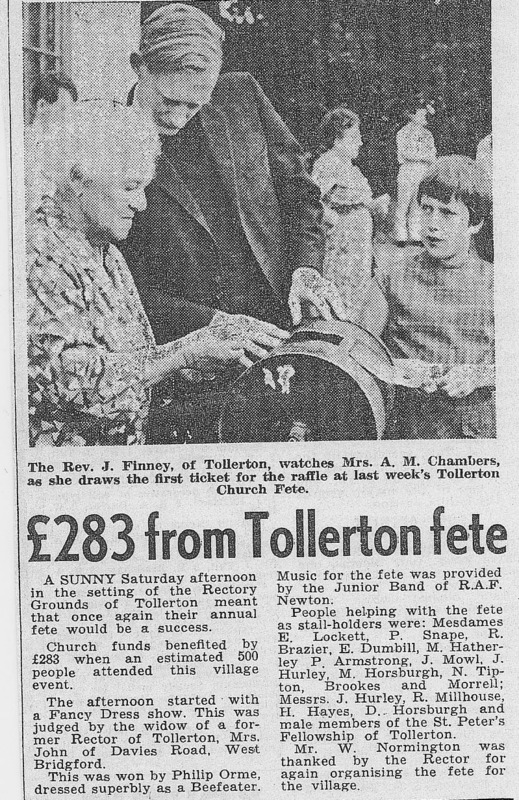 Appearing in the Bridgford and Clifton Standard, September 14th 1968, this snippet shows Mrs Chambers drawing the first ticket of the raffle with the Rev J Finney. £283 was raised! Who would believe we had a lion in Tollerton?